The mwext-VisualEditor-* jobs are no longer taking the submodule into account when starting a build. It checks out the commit of the root repository, but the submodules are stale from whatever commit/branch was last used on that slave/workspace before the bug started happening. While all VE jobs are affected, this is most significantly affecting mwext-VisualEditor-npm because that job asserts the git checkout is clean. I temporarily fixed it by updating the live job config. It looks like the "Disable submodule" option no longer exists, and is now inside a "Advanced submodule options" menu. Since this sub-section did not exist in the XML, this part of the plugin was not triggered at all. Looking at the diff you can see this is caused by the Git plugin having been upgraded and it has a breaking change. jjb will need updating, and re-generating all relevant jobs. Krinkle added projects: Regression, VisualEditor, Contributors-Team, Continuous-Integration-Infrastructure. 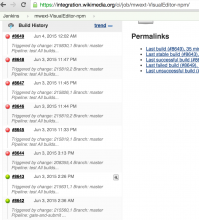 The JJB version on integration/jenkins-job-builder is at the commit just before Update git-submodule configuration to new extension style. It changes JJB syntax https://review.openstack.org/#/c/148057/6/tests/scm/fixtures/git-submodule01.yaml but style recognize the current one. Gotta update our JJB copy and update our yaml config files. Finished too late, had some meetings in the evening. So will process updating jobs carefully tomorrow morning. I have refreshed all the jobs. Should be fine now. I sent a mail to the qa list to have people to update their JJB installation from our fork. hashar moved this task from In-progress to Done on the Continuous-Integration-Infrastructure board. Hm.. that didn't fix it. A couple days ago I updated the VE job config on Jenkins to re-enable the submodule handling (using the newer git plugin version). It looks like your deployment didn't use the newer git config. Instead, it did the opposite and deployed the old code again. This diff removed the hudson.plugins.git.extensions.impl.SubmoduleOption extension and adds the old <disableSubmodules>false</disableSubmodules> back. 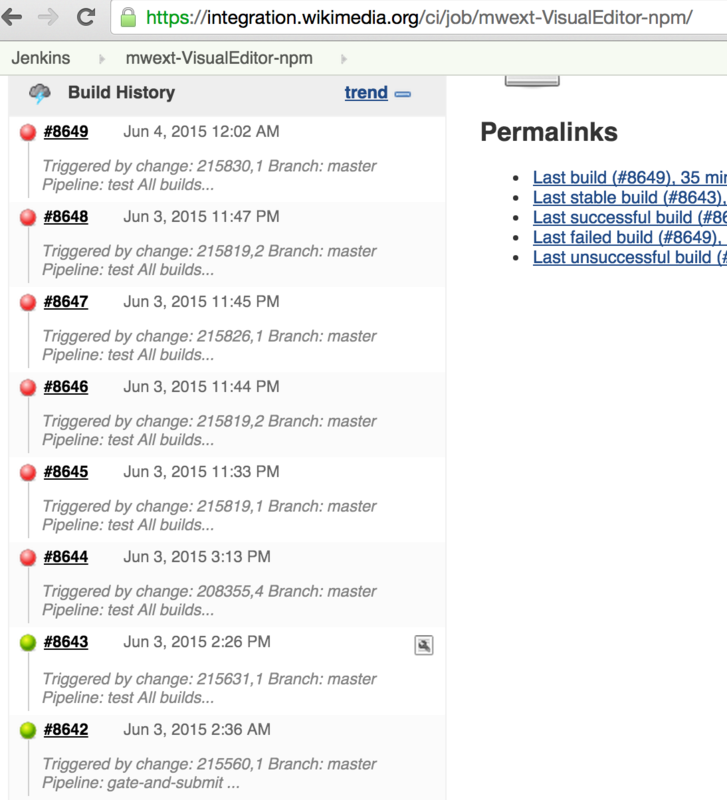 I've reverted the job config update to mwext-VisualEditor-npm on Jenkins for now. And that macro does not proceed submodules. The template has a comment stating it is only used by VE, but it is also used by Wikibase extension, though that last one has no submodule and could use the regular npm job.